Greetings Milwaukee Region members. After a somewhat dormant schedule in winter, our region activities revved up in February with two events. Several more events are on the calendar for the year and more are being planned. Read about the recent events and learn what's coming up in this edition of your newsletter. The answers to last month's rock 'n' roll trivia close out this month's newsletter. March 30 - Fish fry at Thunder Bay Grille, Pewaukee. Pre-order from a limited menu, including a classic fish fry and other tasty entrees. RSVP deadline is March 25. Details here. April 1 - Cars & Coffee hosted by 2 Shores International, at 119 Church St., Lake Mills. Ample parking near the showroom. Rain or shine event. Bring your classic or sports car. Mingle among great cars and visit with the people who own them and like them. Held the first Sunday of the month through October. April 5 - Board meeting -- 6:30 p.m., Wisconsin Club Country Club, N. 60th and W. Good Hope Rd. All members always welcome to pull up a chair and listen or participate in the discussions about matters pertaining to our region. April 21 - Porsche only swap meet in Pennsylvania. Details here. April 21 - Milwaukee Oyster Roast to benefit the Leukemia and Lymphoma society. If we have 10 or more Porsches at the event we can get a reserved area in the parking lot for a mini car show. This is an all-you-eat feast at the Harley Davidson museum. Details here. June 23 - Spring Driving tour. Details coming soon. Jay and Lee Heppe will be leading one of their terrific driving tours that will take us on some of the best roads in Wisconsin. An all-day tour, we'll stop for lunch somewhere along the way. You're welcome to take in either half of the day if your schedule doesn't permit you to devote the entire day to driving. July 8 - 14 - PCA Parade, Salt Lake City Utah, is the beautiful backdrop of the annual gathering of members of Porsche Club of America. Details here. For a week full of everything Porsche, this is it. 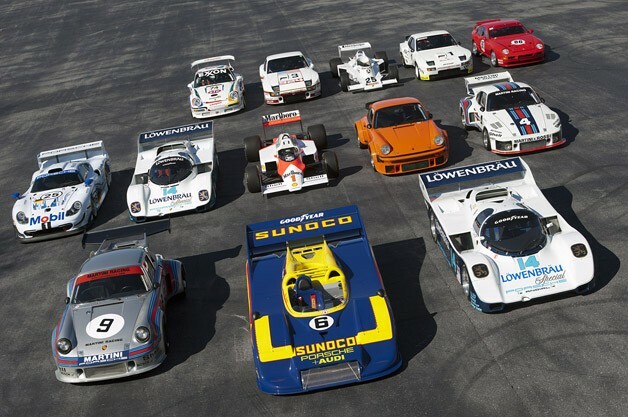 July 14 - Drive to Elkhart Lake to view the Road&Track concours on the streets of Elkhart Lake. This is an incredible event with unbelievable cars. More details to follow. Al Wagner will head up the drive. Aug. 4 - Casual car show for our veterans at the VA Center in Milwaukee. More details later. Plan to bring your car to a special parking area at the VA Center in Milwaukee (near Miller Park) for viewing by our military veterans who live at the center. A week later, the veterans will travel to Road America and enjoy laps around the track as passengers in the cars driven by DE participants. Aug. 10 - Driver education at Road America. Reserve this date on your calendar to enjoy some quality seat time in your Porsche on the track. Novices are welcome. Instructors will be provided. Details here about our 2012 DE season. Welcome also to Suravee Ratanaproek, and his family member Sue Ratanaproek, of Kenosha, who transferred from Chicago Region, 1974 914. The Milwaukee Region welcomed Paul Horanoff recently. Paul reports he is happy to be a first-time Porsche owner with his 1986 911 Carrera. It is Guards Red with 76,000 original miles. “It is all stock and looks like it just came off the show room floor,” he said. Paul attended the Tech / garage session on Feb 4 and plans to attend a few of the Cars and Coffee gatherings in the summer. He also hopes to make at least one function a month with Road America being high on the list. Paul is a manufacturing engineer for Harley Davidson and has been into motors and cars since he was a kid. “I hope to do some of my own work on the car and also teach my kids a thing or two in the process,” he concluded. Chief Driving Instructor Ron Pace shares a recent discovery he made that will give him a unique advantage over other drivers when he and his 944 Turbo hit the racing circuit this season. Read all about it here. 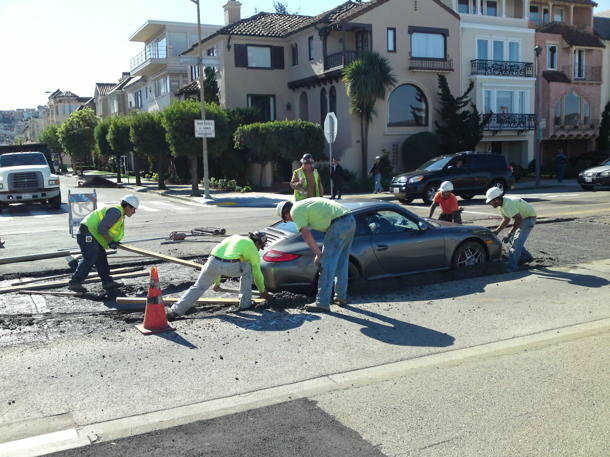 This has been all over the 'net but in case you missed it, check out the mess one driver in San Francisco found himself in when he thought he could get around stalled traffic. We hope the car has recovered from its immersion in wet concrete and that the driver is sticking to harder surfaces in his motoring. It's Por-sche -- two syllables. Really. Thanks to Al Wagner, who recently communicated with a local Milwaukee TV news reporter, as he corrected her pronounciation of the word Porsche which she read in one of her stories incorrectly as one syllable. As most of us know, it's a two-syllable word: Por-sche. The reporter graciously expressed her thanks for the correction. 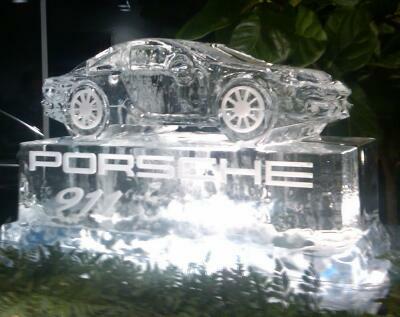 Let's win over those who still say Porsche with just one syllable. Dr. Ferdinand and his descendants of the Porsche family thank you for saying it correctly. Two syllables please. Looking for another Porsche? Check out this collection that will be auctioned. Read this insightful review of one of the nicest cars produced by Porsche. Members who have bragging rights for the rest of the year for their winning entries in the 2012 Turbo Spaghetti competition include Donna Daufenbach, Lise Miley, Jan Spiegel and Sharon Stewart. The Feb. 18 event was extra special as 50th Anniversary Committee chair Gary Messing presented a check for $1,500 to Debra Tews, who represented the Wisconsin Chapter of the Susan G. Komen for the Cure organization. Members gathered for a photo with Tews (pink sweater) above. The region raised the funds during its 50th anniversary celebration. Read more about this event, including a number of photos, here. The early February get together at Ron Pace's toy barn was well attended. The unstructured event provided attendees with the chance to talk about winter projects and plans for the coming driving season. 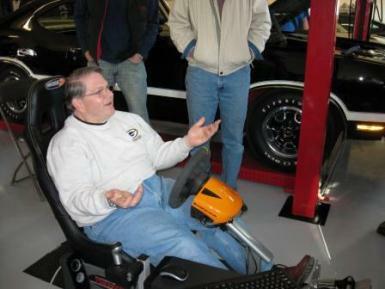 They also could try their hands (and feet -- brake and clutch required) at the track driving simulator. More photos here. This is a video story that reveals the author's perceptions of the new 911. I won't reveal his conclusions but he says the PDK is "incredibly quick" and the 911 has a "fabulous chassis." He calls it the "best 911 ever" but does he say it's better than GM's latest 8-cylinder 'Vette? Watch and see. Enjoy the video here. Thanks to Lise Miley for the tip on this video. 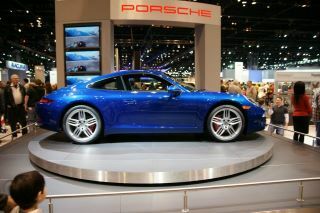 at the 2012 Auto Show in Chicago. Answers to last month’s trivia game in which you had to match the artist with the song.